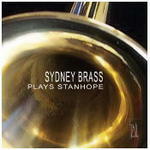 Performance by Sydney Brass from the CD Sydney Brass plays Stanhope. Three folksongs for brass quintet / by David Stanhope. San Antonio, Tex : Southern Music Co., c2001. Fable, fantasy and folksong / Melbourne Brass Ensemble. Instrumentation: 2 trumpets in B flat, horn in F, trombone, tuba. 5 May 2017: at Australian Brass Quintet (Macquarie Conservatorium). Featuring Australian Brass Quintet. 2 May 2017: at Australian Brass Quintet (Christ Church Cathedral, Grafton). Featuring Australian Brass Quintet. 30 Apr 2017: at Australian Brass Quintet (To be confirmed). Featuring Australian Brass Quintet. 29 Apr 2017: at Australian Brass Quintet (Gunnedah Conservatorium). Featuring Australian Brass Quintet. 28 Apr 2017: at Australian Brass Quintet (Tamworth Regional Conservatorium of Music). Featuring Australian Brass Quintet. 19 Apr 2011: at Australian Brass Quintet (Australian National Academy of Music (ANAM)). Featuring Australian Brass Quintet.